I am almost finished reading this entertaining book. The sub-title is “An (Unlikely) Theory of Globalization” and Foer looks at the two competing forces of globalization and tribalism. I am very interested in the tribalism aspect of soccer, especially when he begins the book here in Belgrade and looks at Red Star, my favorite team in the Serbian professional league. In every country I lived, I always pick a soccer team to support. In Colombia, it was Junior of Barranquilla, in Bolivia is is Oriente Petrolero of Santa Cruz, in Australia it was the now defunct Perth Glory, and in my last post in Venezuela, baseball took the role of soccer and I supported Caribes de Oriente. So it was natural for me to select a team upon arrival in Belgrade. I am not sure what determines the team, as I usually have a choice. Part of it is the tradition and history of the club, another are the uniforms, atmosphere at the stadium, etc.Many Serbs question why I would support Red Star when they are financially unstable and in recent years, have not been very successful. I guess it is that I live in the part of Senjak neighborhood that is rabidly devoted to Red Star and the team was formed by Serbs who were against facism shortly after WWII. The club is associated more with the police and the Serbian Chetniks, than the Communist era of Tito. They are the most popular club in Belgrade, with approximately 1/2 of all Serbs supporting them. I also like the red and white color scheme over the black and white of Partizan, the rival club and the second most popular team in Belgrade. The book is a bit dated being published is 2004, and I would like the New York Times writer Frank Foer to update each chapter. The most poignant idea Foer presents in the book is the human need to associate with a group or tribe. Humans he states, have a natural urge to associate themselves with a group, and in today’s society, the family or tribe is not relevant. Soccer clubs in many instances, fill that role and it explains the rabid enthusiasm of fans at times, even when they are not really big soccer players and do not show this allegiance in other parts of their lives. I see the appeal of this and it might be the reason I always support a local club when posted overseas. It is something that is definitely missing for most Americans. My family is spread out over the world, the USA is very large and diverse and although it somewhat gives me an affiliation, a “tribe” based on the constitution and the ideal of the freedom of the individual, it doesn’t make me feel part of an intimate group. Serbians, being part of a small ethnic group, naturally have that feeling. And with Red Star and other clubs, they also feel the comfort of the “tribe.” Foer goes into the uglier side of tribalism in the Red Star chapter. 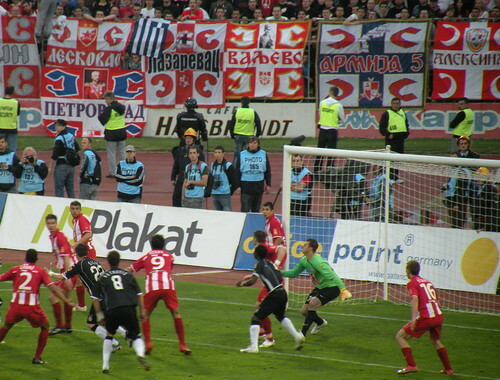 The Red Star fans are called Delije, which is a moniker given to them by the infamous Serbian soldier, Zeljko Raznatovic, “Arkan.” Historically, they called themselves Gypsies. 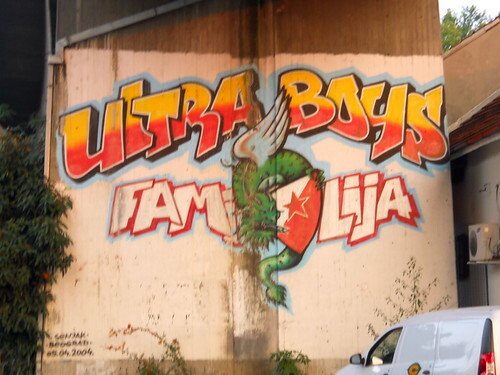 The book details some of the fan clubs within the Delije, which can be translated as “heroes” or “warriors.” Above is a photo of one of the many fan club murals popular here in Senjak, the Ultra Boys. Around Red Star Stadium there are some interesting murals which I should do a blog post about someday. Anyway, the Red Star fans played a big part in the wars against Croatia and eventually the revolution against Milosevic, according to this book. The book has chapters on Celtic-Ranger, Barcelona-Real Madrid, Brazilian professional soccer, etc. and they read as separate essays. I would recommend the book to any soccer fan and people interested in history and politics. On a separate note, nice to see Red Star on top of the table in the Serbian Professional League after five rounds. They defeated Javor yesterday, 1-0. Viva la Cervena Zvezda!! It is my husbands and now my team. I Am going to read that book. Sounds great for a social scientist like myself. Hvala for sharing.